The club was established by a group of adventure seeking individuals that shared a passion for riding motorcycles, in particular the BMW brand. The club joined the national BMW Motorcycle Owners Association in 1972 and became the 21st Charter club of the national organization. We joined the national BMW Riders Association in 2015 and became Charter #361. Our membership is made up of a diverse group of people that enjoy everything from day rides to international travel and touring. Some of us enjoy riding the main roads, some enjoy riding back roads, and others in our group love motorcycles but don't ride. You are bound to find a few in our group who enjoy the type of riding you enjoy. We love riding to and participating in BMW motorcycle rallies near and far, where we see old friends and meet new ones. If you're interested in the club, the people, and getting to know who we are, contact us. We love to ride motorcycles, talk about, or even just look at them. We have an annual Poker run which everyone in the club helps with hosting. We also enjoy doing other things with our club members, like pig roasts and picnics by the lake. In the winter while the bikes are in the garage we like to do weekend getaways. We meet every Sunday (Summer and Winter) at the Farmer Boy Restaurant on Canton Rd, 200 yards south of SR 224, in Akron ( 41°01'46.7"N 81°25'35.8"W ). Members typically arrive between 7:15 - 7:30 for breakfast and plenty of conversation. 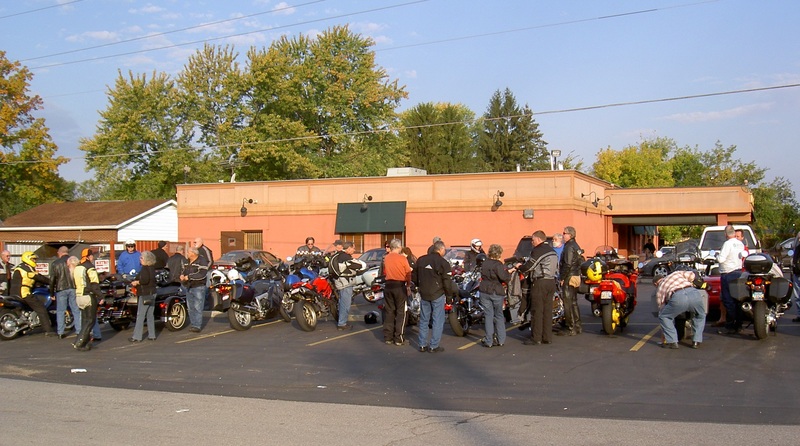 During riding season we typically get together for a ride following breakfast, with maybe a lunch or ice cream stop along the way. If you are interested in becoming a member, please contact us using the Contact Us page.